Noël Brem (variations: de Bremme/Bresme), dit Lebrun and dit Carrier in Quebec, was born on novembre 22, 1665 in the lower town ("faubourg") or Saint-Nicolas parish, Boulogne-sur-Mer, Pas-de-Calais, France. He was baptised under the family name of "de bhram" the day after his birth, that is, on november 23, 1665 in Saint-Nicolas church. His godfather has been Noël Gorré, shoemaker, from whom he received his first name. His godmother has been Anne du Chossoy. Anne is the third child of a family of four: Jean (Junior) born in 1672, Marie born in 1675 and herself born in 1678. Anne had been baptized on March 28, 1678 in Saint-Jean. 9 It is not very probable that Anne attended school. Thus, she would declare, in her marriage contract, that she could not sign. In 1685, when Anne was 7 years old, a school is opened in Sainte-Famille parish. The Brochu family had lived in this parish but before the opening of this first school of the Island of Orleans. 10 The baptism of Mathurin that took place in Saint-Jean plus the indication of Jean Brochu in Saint-Jean on the map of Villeneuve in 1685 are two evidences of this anteriority. On July 8, 1696, Noel and Anne had already promised mutual fidelity since we find them, on that Sunday afternoon of summer at the notary François Genaple in Quebec City for the writing of their marriage contract. This document reveals us that the groom had to receive the "approval, permission and assent of his employer Monseigneur de Champigny ". Noel and Anne were accompanied by their parents and their friends. We can note the presence of Jean Brochu habitant (farmer) from Saint-Jean, father of the future bride, Pierre Blin (or Blain) of the same county of Saint-Laurent and that of Jean Auger habitant from the seigniory of La Durantaye and Charles Mossion dit La Mouche (Junior) friends of the Brochus. Also, there are also Pierre and François Moreau. The engaged couple promised to share their goods: "will be ones and common in goods and chattles, according to the Paris custom 11 for the love and the affection they have one to the other". Mr and Mrs Brochu on their behalf, promise to give the sum of four hundred pounds during the first year of the marriage as avancement d'hoirie . At the same time, Noel Brem promised to give the same amount in douaire to his future wife. This money would be used one year later to purchase their first house, the house of Laurent Tareau. In the mean time, on September 9, 1696, Noel Brem (dit Lebrun and dit Carrier) rented a house at the cost of 72 pounds, from Timothee Roussel surgeon at Hotel-Dieu hospital in Quebec City. 11a This house was on Du Palais street 11b and located between Henri Delaunay cartwright and Jean Bridault carpenter, near the Hotel-Dieu hospital. The house included a room at street level ("de plein-pied") with a chimney, an additional room upstairs and an adjacent court. This is where Noel Brem first lived alone and later on with his young wife from the marriage on February 4th through the next summer when they moved to Saint-Vallier. Seven long months after their marriage contract Noel Brem dit Lebrun and dit Carrier and Anne Brochu linked their destiny, in full winter, on Monday 12 February 4, 1697. 13 The ceremony took place in the church made of half-timbering, mesuring 45 feet by 20 dedicated to Saint-Jean. 14 The marriage was probably celebrated by Father Damion 15 The bride is 18 years old and groom 31. There was strong incentives tending to push Noel (Senior) to come to settle in Saint-Michel (the east end of Saint-Michel will become Saint-Vallier). The sum of four hundred pounds provided by his father-in-law was obviously used to pay for the house of Laurent Taureau as well as the need for the seigneur to develop his lands 18 defenitly forced Noel (Senior) to leave his job from Champigny and start his own business. However in the contract of the purchase of the dwelling itself that we find a convincing indication that Noel Brem (dit Lebrun and dit Carrier, Senior) continued to work as taillandier (cutting tool maker) in Quebec City between the time of his marriage and the purchase of the house of Laurent Tareau. In this transaction, the salesman specifies that: " the purchaser will give as epingle 19 of the said sale, a good axe [ made by himself ] .........". The indentification of Noel Brem as being still "a taillandier in the said town [of Quebec City] " at the date of the contract attests clearly that our ancestor continued to work his trade in Quebec City after his marriage. In July 1697, Anne was already four month pregnant when the couple decided to buy the dwelling of Laurent Tareau. Also the parents of Anne would reside in Saint-Michel (Saint-Vallier part). We can find them in 1709 on the Catalogne map, the seventh neighbor from their son-in-law going towards the village of Saint-Michel. The contract signed with Laurent Tareau gives us other interesting details. The lot was of an appreciable surface: it had three arpents 20 of frontage on the St. Lawrence river and was forty arpents deep, of which "fifteen to sixteen were in culture and the remainder out of standing trees". The salesman, kept the grains, vegetables and what he had sowed and cultivated, 24 a squared piece of yellow birch 25 as well as a pile of stove wood to be used to pay the cens to the seigneur. He also retained the right to tresh and garner his grain and asked for the axe already mentioned. In addition to Noel Brem (dit Lebrun and dit Carrier, Senior) and Laurent Tareau, present to the signing of this contract was : Sr Michel Pailleur royal bailiff in Quebec City and François Moreau (Junior) who was living on Nicolas street in Quebec City. Once moved into their new residence, the Carriers of the first generation, like any new owners had to make some repairs. To be convinced of it, let's remember the emphasis made by the salesman, namely that the dwelling was "in the state that the whole behaves whose purchaser is held content to be informed without making fuller mention of it". They did a good job since in October 1697, Sr de la Durantaye added a footnote to the contract expressing his satisfaction following that sale. Close to Christmas, ten months and half after their marriage Anne and Noel (Senior) had a baby girl : Marie-Anne who was baptized on Friday December 13, 1697 in Saint-Michel. On March 29, 1699, Noël Brem (Lebrun dit Carrier, Senior) was called by merchant Gabriel Duprat to testify in front of the Prévôté de Québec . 26a He declared not owing anything to Duprat but that his father-in-law, Jean Brochu owed 200 pounds. A little more than two years came to pass before the first boy was born. Howeve, he was not alone. He was indeed accompanied by a twin sister. They called the boy Noel (Junior) since it was the custom to give the elder boy the same first name as his father and the twin sister 28 was named Therese. The duet was baptized Tuesday September 16, 1704 in Saint-Michel. In 1705, they had another girl whom they named Elisabeth. In 1709 a second boy was borned who was named Louis on Sunday May 19 in Saint-Michel. It was also in 1709 that we can pintoint exactly the place of residence of Noel Brem (dit Lebrun and dit Carrier, senior). This was the year Sr Gedeon de Catalogne assisted by Jean-baptiste Decouane drew the map of the seigniories from Quebec City area. 29 We can see on it the property of our ancestor facing the St. Lawrence river and with a small river going through it. Other countrymen would call (in 1721) this river "Noel Lebrun dit Carrier's river" 30 Today, the same river is called Riviere des Meres after the religious congregation "Les Meres Hospitallieres". On this map, we can also notice, in the vicinity of Noel Brem (dit Carrier, Sénior), the presence of Jean Brochu 31 and several other names which will mix with our family. In the spring of 1710 Noel Brem who was now 41, exchanged the lot he had received in heritage from his father-in-law for another lot close to him, with Guillaume Leroy. The exchange was done in two steps. Initially, on Monday April 28, 1710, there was a promise of exchange made between Noel Brem and Guillaume Roy. 32 This first part of the exchange was written in a clear style by Mr Plante priest in Saint-Michel 33 whereas Pierre and Jacques Corriveau were witnesses. In this contract written in a nebulous style, Guillaume Leroy gave to Noel Brem a lot located in the seigniory of La Durantaye, having one arpent of frontage by 40 of depth, limited at the short end ( North-West) by the St. Lawrence river, to the North-East by the lot of Jean-baptiste ("Baptiste") Leroy and to the south-east by a lot not yet conceded. 34 Noel Brem declared to have a good knowledge of the lot since Guillaume Leroy was his neighbor. Guillaume Leroy had inherited this lot from Pierre Bassin and Marquerite Leblond father and mother of his wife. Noel Brem offered in exchange a lot of one half-arpent facing the St. Lawrence river by one mile of depth or approximately, located on the Island of Saint-Laurent (Island of Orleans). De la Riviere delimits this way the lot that Noel inherited from his father-in-law : south-eastern limit : the St. Lawrence river, north-eastern limit : the lot of Jean Laviolette, south-western limit : middle of the Island (of Orleans). Laplante had defined as follows the same lot : "a part of lot 35 mesuring one half-arpent to be taken adjacent to the line of Laviolette, neighbor to the said lot". He declared both lots to be free of mortgages or other restrictons. The lot Noel is exchanging today, was received by heritage from the late Jean Brochu 36 . The act of exchange that was written in Beaumont ended by the official transfer of the documents and property : "The said parties respectfully transported one to the other all and such rights of ownership." The youngest of the family, Etienne was baptised on sunday, October 7, 1714 at Saint-Vallier. The father was then 45 and the mother 36. Marie, the oldest was to be 17 in two months and the oldest boy, Noel, was just 10. This baptism as well as the marriages of the girls would all take place in Saint-Vallier whereas the preceding baptisms (except that of Joseph) had taken place in Saint-Michel. This did not mean that the Brem-Carriers moved. The reason is that the part of the seigniory of La Durantaye located east of Boyer river (La Durantaye river) was transferred from Sr Olivier Morel de la Durantaye to his son Louis-Joseph and Saint-Vallier became a disctint parish from Saint-Michel. Thus, on October 29, 1714, Mgr de Saint-Vallier named this new parish Saint-Phillipe and Saint-Jacques. 40 This double name was later changed to Saint-Vallier. Then came the marriages of the first de Bremme ("dit Lebrun or dit Carrier" born in Quebec. It was initially the elder, Marie-Anne who, on Monday February 3, 1716 left her parents to link her destiny to major 41 Michel Gautron dit Larochelle. The marriage took place in the church of Saint-Vallier. The bride was 18 years old and the groom, who was from Saint-Michel, was 26. This was his second marriage. Two years before, in 1714, he had married Marie-Anne (no risk to be mistaken with the first name!) Alaire. 42 We can find the birth of the children of Marie-Anne Lebrun dit Carrier and Michel Gautron in Saint-Michel betwen 1717 and 1739. Major Gautron probably exerted a military command covering both Saint-Michel and Saint-Vallier. and, from this river, three arpents minus one perche to the end of the concession. Its north boundary was the river and the south one, the lots of the second concession. It was limited to the west by the lot of Louis Boutin. 45 Noel Brem who still works as taillandier, will have to reside on this lot or at least "desert"(clear up) 46 what his neighbors would consider necessary. He would have, over the width of this lot to make and maintain the royal road. He would also have to bring his grain exclusively to the mill of Sr Morel. On this lot, our ancestor received the right to hunt partridge but at each year, the first salmon and the eleventh catch of all other species would go to his seigneur. He would have to deliver them to the seigneurial manor . Moreover, each year, he would have to pay twenty sols and bring to him a chapon en plume" (poultry) 47 alive for each three arpents of frontage on his concession, plus thrree sols of cens, the whole delivered at the St.Michael mass. Noel Brem would also have to give preference to Sr Morel whenever he had any wood to sell. This concession, added to the exchange with Guillaume Roy made Noel Brem the owner of three adjacent lots (or almost) in the first concession of Saint-Vallier. Three years after this contract, Helene-Angelique Lebrun dit Carrier daughter of Noel and Anne married Joseph Gautron brother of Michel, in Saint-Vallier. The day was Monday November 24, 1721. The bride was 19 years old and groom 27. We also know that in 1721, Noel Brem still lived at the same place that in 1709. When Mathieu Benoist Collet ecuyer(squire), Sr de La Frontiere made his investigation about "the convenience and inconvenience in each parish of New France", 49 parishioners from Notre-Dame de l'Assomption ask for a residing priest "due to the difficulties of going to La Duranthye since we have two rivers to cross that is to say the Guillaume Lemieux river (Bellechasse river) of and that of Noel Lebrun dit Carrier 50 on which it is impossible to make bridges and that we can ford only at low tide. Moreover, these rivers cannot be crossed over on ice. On January 15, 1730, 55 it was now Marie-Therese Lebrun dit Carrier twin sister of Noel (Junior) who left her parents to marry at 25, Pierre Dodier son of Ange Dodier and Marguerite Pare. They would have five children of which Louis, the third, would marry on Monday July 20, 1761, at the age of approximately 26 years, Marie-Joseph/Jsephte Corriveau who, two years later, in the night of Wednesday 26 to Thursday January 27, 1763, would brutally assassinate him in his sleep using a hatchet. 56 In this case, the son of Marie-Therese Lebrun dit Carrier, Louis Dodier would be the victim and the daughter of Marguerite Lebrun dit Carrier, Isabelle Veau dit Sylvain would be one of the main witnesses. On June 27, 1742, Etienne Lebrun dit Carrier the yonger son of Noel Brem (Lebrun dit Carrier, senior) married in his second wedding, at Saint-Joachim, Marguerite Bolduc daughter of Rene Bolduc and Marguerite Malboeuf. From this union eight children would born. In 1737, Joseph Lebrun dit Carrier son of Noel Brem, at the age of 25 years, married Genevieve Dallaire. This marriage took place in Saint-Vallier. The son shall also bring his father and mother to the church every sundays and holydays, transform their grains into floor, and the day they will be unable, to knead their bread, wash and repair their clothes without forgetting to supply them with 20 pots of alcoolic drink ("eau-de-vie"). Of course, he shall also look after their funerals and have them celebrated 80 masses for the rest of their soul. Donation from Noël Brem dit Lebrun and dit Carrier and Anne Brochu to their son Noël, march 5, 1743 by Louis Pichet, notary. On Sunday, December 28, 1749, Anne Brochu the mother of all Lebrun dit Carrier leaves us. She was 71 years old. As for her husband born in France, Noel Brem (Lebrun dit Carrier, senior) the transplantation would not have shortened his days, since at his death, he was said to be 112 years old. 57 This age was exaggerated, but, he nevertheless was 91 (since he was born in 1665). His burial took place on Thursday January 15, 1756 in Berthier, Quebec 58. Burial of Noël Brem (dit Lebrun and dit Carrier) January 15, 1756 at Berthier, Quebec. "L'an mil sept-cent cinquante six le quinze de janvier a été inhumée dans le cimetière de cette paroisse, par nous ptre soussigné missionnaire de berthier, avec les sérémonies ordinaire, nôël lebrun dit Carier, français agée danviron cent douze ans apres sestre confessée et avoir recue lest viatique et lextreime unction, plusieurs ont assistée a son innumation dont les uns ont signé les autres ont déclaré ne le scavoir de ce enquis"
In english: In the year 1756, on January 15th, has been buried in this parish, by us undersigned, missionnary from Berthier, having received ordinaries ceremonies, Noel Lebrun dit Carrier, frenchman, aged of approxymativly 112 after having confessed his sins and having received the last sacrament. Many persons assisted to his burial. Some have signed and others have declared being unable to sign. 1a Between 1680 and 1700, there were only 18 emigrants coming from Picardy. L Groulx, LA NAISSANCE D'UNE RACE (THE BIRTH Of A RACE), page 283. 2 Person who manufactures tools suitable for cutting. The taillandier also manufactures plough. 3 Taken from Etude genealogique d'une famille Carriere de Montreal, MEMOIRES DE LA SOCIETE GENEALOGIQUE CANADIENNE-FRANCAISE, vol. 18, No 4, pp 108-109. 4 The census of 1695 is signed by Champigny. 5 Quotation from de La Honta in : LA CIVILISATION TRADITIONNELLE DE L'HABITANT AUX 17e ET 18e SIECLES, page 286. R. L Seguin, Fides editions, Montreal, 1973. 6 This toponym was later changed to Bellefine. L'ILE D'ORLEANS, by the Commission of the historic buildings of the province of Quebec, 1928, page 281. 7 Lot No 38 west half and 39 and 40. RAPORT DE L' ARCHIVISTE DE LA PROVINCE DE QUEBEC POUR 1951-52 ET 1952-53, page 321. 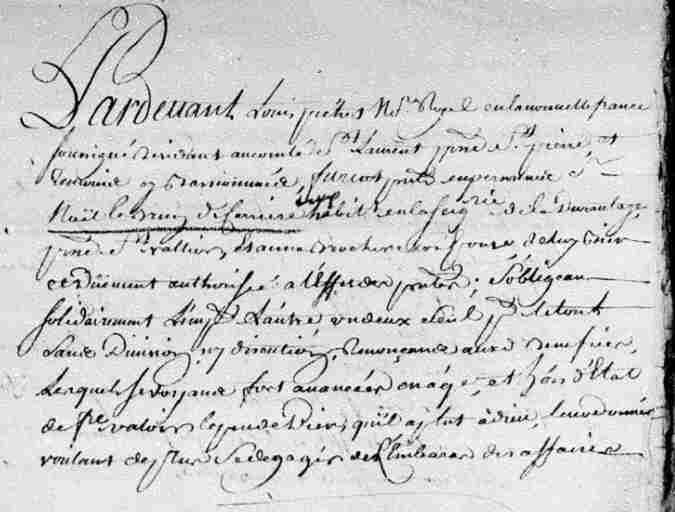 8 Concession from Olivier Morel de la Durantaye to Jean Brochu, August 3, 1691, Gilles Rageot notary. 9 The Brochus would thus have moved from Sainte-Famille to Saint-Michel between 1678 and 1682. 10 R. L Seguin, LA CIVILISATION TRADITIONNELLE DE L'HABITANT AUX 17e ET 18e SIECLES, page 110. 11 Set of laws written in 1580 under Henri III and applied to New France (Canada) at least from 1637. Michel Guimond, LA PLACE ROYALE, Quebec 1976, page 28. 11a Contract of renting ("Baillage") from Thimotee Roussel to Noel Lebrun taillandier, Septembre 9, 1696. Charles Rageot sr de St-Luc notary. 11b The name of this street comes from the Intendant's Palace which was the converted brewery of Jean Talon. It burned in 1713. Rue Du Palais was later (in 1890) renamed "Cote du Palais". 12 The tradition folowed by the Carriers to get married on Mondays goes from Noel (Senior) in 1697 to Arthur in 1912. 13 Tanguay, DICTIONNAIRE GENEALOGIQUE DES FAMILLES CANADIENNES, vol. 5, page 232. 14 General state of the missions of Canada made in 1683. Commission of historic buildings of the province of Quebec, L'ILE D'ORLEANS, 1928, pages 281 and 282. 15 Danion in RAPPORT DES ARCHIVES CANADIENNES POUR L'ANNEE 1905, 1906, vol. 11, page 341. 16 Sale from Laurent Tareau and Jeanne Gaboury his wife to Noel Brun dit Carrier, July 13, 1697, François Genaple, notary. 17 Variation: Saint-Thomas de la Pointe-a-la Caille. 18 In 1693, Sr de La Durantaye had received an extension to his seigneurie east of the Boyer river. 19 To symbolically seal the transaction. 20 In 1690, one square arpent (of Paris) mesures one hundred square perches (poles) and a perche is a square of 18 feet (French) on the side. Taken from the Marriage contract between Gilbert Barbier and Catherine de La Vaux, November 15, 1690, Jean Sainct-Pere, notary, Juridical Archives of Montreal. We can deduce from it that the linear arpent mesures 180 French feet. 21 Concession from Sr de La Durantaye to Laurent Tareau, 1690, Quebec, Abel Michon, notary. 23 The monnaie de carte currency is a handwritten currency and shows the signatures of the Governor, the Intendant and the Commissaire-ordonnateur (Chief of police) . R. L Séguin, LA CIVILISATION TRADITIONNELLE DE L'HABITANT AUX 17e ET 18e SIECLES, page 38. 24 Tareau thus lived on this farm until July 1697. 25 The scientific name of the yellow birch is betula lutea and it was used by our ancestors mainly to make interior staircases. Michel Gaumont, LA PLACE ROYALE, Ministry of cultural affairs, Quebec, 1976, page 38. 26 Rev. Father Marie-Antoine, ST-MICHEL DE LA DURANTAYE, NOTES ET SOUVENIRS, Quebec, 1929, page 27. 26a Prévôté de Québec , Register 36, March 29, 1699, folio 31. Taken from Dictionnaire des ancêtres Québécois (1608-1700) Volume III, page 170, by Michel Langlois, 2000. 27 Rev. Father Marie-Antoine, ST-MICHEL DE LA DURANTAYE, NOTES ET SOUVENIRS, Quebec, 1929, page 42. 28 The date of the baptisms is the same for Noel (Junior) and Therese. Tanguay, DICTIONNAIRE GENEALOGIQUE DES FAMILLES CANADIENNES, VOL., 5, page 32. 29 Marcel Trudel, ATLAS DE LA NOUVELLE-FRANCE , Presses de l'universite Laval , 1968, pages 164 and 165. 30 REPORT DE L' ARCHIVISTE DE LA PROVINCE DE QUEBEC, vol. 2, 1921-22, page 337. 31 His name does not appear any more on the Island of Orleans though there is a M. Brochu. 33 Rev. Father Marie-Antoine, ST-MICHEL DE LA DURANTAYE, NOTES ET SOUVENIRS, Quebec, 1929, page 51. In 1710, Saint-Vallier does not exist yet and the residents of this part of the south shore of the St. Lawrence are ministered by Charles Plante of Saint-Michel de la Durantaye, from November 1704 to November 1711. 35 The property of Jean Brochu dit Lafontaine is on lot number 20. It has 3 arpents (in culture) in 1666 then 16 in 1689. Lot No. 38 west half, and 39 and 40. Census of 1666, page 82. RAPORT DE L' ARCHIVISTE DE LA PROVINCE DE QUEBEC POUR 1951-52 ET 1952-53. 36 Jean Brochu, father-in-law of Noel Brem was deceased in 1705. He had had his burial in Saint-Jean, I.O. on February 28. 37 Variations: D' Orivillier, Antaya. 38 Corroborated by Lavallee in: PETITE HISTOIRE DE BERTHIER, Lapocatiere, 1973, page 212. 39 Rev. Father Marie-Antoine, ST-MICHEL DE LA DURANTAYE, NOTES ET SOUVENIRS, Quebec, 1929, page 56. 41 Military Canada, RAPORT DE L' ARCHIVISTE DE LA PROVINCE DE QUEBEC, vol. 30-31, 1949-51, page 326. 42 Daughter of François. The burial of Marie-Anne Alaire took place on September 21, 1715 in Beaumont. No child. Tanguay, vol. 4 page 222. 43 Written by notary Abel Michon, Montmagny, April 29, 1719. Kept in Archives Nationales du Quebec, in Quebec City. 44 Riviere des Meres also called "Noel Lebrun dit Carrier's river". See the investigation of Mathieu Benoist Collet Sr de La Frontiere. 45 See on the Catalogne map the lot not conceded (in 1709) between that of L Boutin and Carrier-Carriere. 48 This contract was probably written in the absence of Noel Brem since he did not sign as he did previously. This could explain the great amount of duties imposed to the purchaser and the not less great number of privileges exerted by the seigneur. 49 RAPORT DE L' ARCHIVISTE DE LA PROVINCE DE QUEBEC, vol.2, 1921-22, pages 336-338. 53 Luc Lacoursiere, "triple destiny of Marie-Josephte Corriveau" in Les Cahiers des Dix, Montreal, 1968, No 33, pages 213-242. 54 Marriage contract between Joseph Mercier and Elisabeth Bruent (Lebrun dit Carrier), January 30, 1729, Abel Michon, notary. Archives nationales du Quebec, Quebec City. 55 If Tanguay is exact, January 15, 1730 is a Sunday. 56 "Hatchet" in the original text in English or "broc" (a kind of pickaxe with three prongs) according to Philippe Aubert de Gaspe in LES ANCIENS CANADIENS, 1897, page 227. Reference: Luc Lacoursiere, LE TRIPLE DESTIN DE MARIE-JOSEPHTE CORRIVEAU 1733-1763 (The Triple Destiny of Marie-Josephte Corriveau 1733-1763), in Les Cahiers des Dix, No 33, 1968, Montreal, pages 213-242. 56a Donation by Noël Lebrun dit Carrière and Anne Brochu to Noël Lebrun their son, March 5,1743. By notary Louis Pichet, Registre des insinuations de la Prevote de Quebec, vol. 9, pages 505-509 CR301,P2315. 57 Tanguay vol. 5, page 232. 58 Taken fron the register of the parish of Saint-Vallier.